Time for the LeftOverQueen Joust again!!! 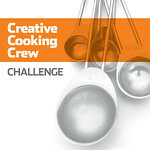 You still have some days left to enter into this FANTABULOUS Foodie Event! 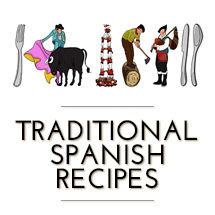 Easy rules, great entries, big expectation, wonderful recipes… what else can you ask for? The Joust is served! For those of you who still don’t know who Jenn is, I’ll tell you: She is the woman in charge, She is the 5 Michellin Aprons’ owner ;-)… still reading? Run to her place and join the feast!!! This month’s ingredients were: Lime (hard to find here… but I did), raspberries (harder to find here… but I found a wonderful jam) and almonds (there’s plenty of almonds here… no problem with that). I’ve been thinking and thinking what could I do with those ingredients and when I finally get the picture of jam raspberry’s muffins… Meghan from Craving for Perfection has been faster than me! So after searching through all my books and magazines, I got some inspiration from a Spanish recipe: Duck with cherries sauce (which I’ll post about some day). 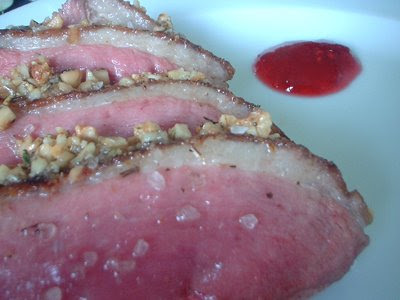 If you have never tasted duck’s breast… please do! It’s one of the tastiest meats and so tender… Mmmm. Just delicious! If you combine it with a sweet ingredient… then, my friend, you’ll be in heaven!!! These are some of the wild ducks we have at the mouth of the Ebro River (south of Catalonia). The breasts I used for this recipe are not from wild ducks, though. I went to a farm where they are raised in captivity but in a big space and in day light and good grain. All these shows in their meat… Mmmmm. Ok, now to the recipe! Ingredients for 4 servings: 2 ducks’ breasts, 4 raspberries jam’s tablespoons, 1 lime‘s juice, 20 grs of toasted ground almond, 20 grs of ground walnuts, 2 teaspoons of provence herbs, 3 or 4 olive oil tablespoons, some black ground pepper and thick sea salt. Heat a big pan and when it’s very hot add the 2 breasts. First do the fat skin one and when it’s brown, do the other side. Notice that it leaves a lot of oily fat; to avoid boiling the breast in its own fat, first cook one – empty the pan from the oil – and do the other after. Once they brown in both sides, reserve. Prepare the walnuts, almonds and herbs and throw them in a mortar and smash until you get small pieces, add the olive oil and some salt. Reserve. With a kitchen brush or with a spoon, add the nuts mixture to the breasts. Both sides should be covered. When the oven has achieved 200ºC place the breasts in a Pyrex glass container and over the middle rack. Have for 10 to 12 minutes. Meanwhile prepare a sauce with the raspberries jam, the lime juice and a sprinkle of ground black pepper. To serve the dish: Cut the breasts in slices, drop some thick sea salt on top and add the raspberries sauce to one side of the plate. Mix all ingredients while eating. The contrast of flavours is spectacular! I absolutely LOVE this Nuria! I love how you combined the Joust ingredients to come up with this savoury dish. Well done and good luck chica! What an incredibly appealing dish! You’ve used the joust ingredients to perfection. Great job, Nuria!! 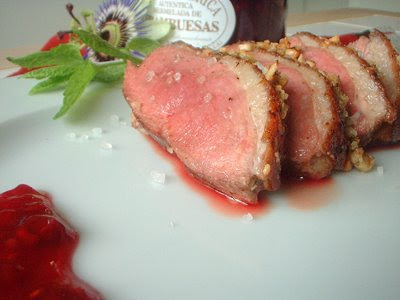 Nuria, what a wonderful creation and the duck is seared perfectly pink! Good luck in the Joust! He, he… thanks so much darling Peter :D You are welcome anytime for some duck!!! You make me laugh Jenn!!! There’s so many good recipes… it’s really tough to get your beautiful apron! I love how you have prepared and plated this….also great addition are the cute ducks on the water! OMG Nuria, I am so in love with this it’s not even funny. 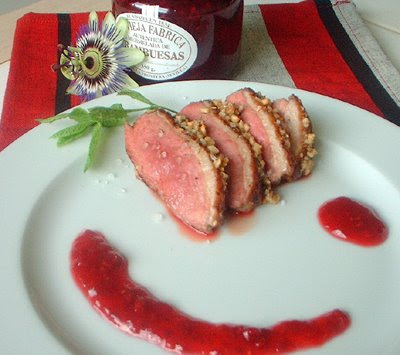 :) Duck breast is one of my favorite proteins ever. And with almonds? It can only be better. Great entry for the joust! This looks incredibly Nuria! I love duck and fruits together. BTW… I ended up reading about your drought situation after your comment yesterday. I’m so sorry that the Catalans are going through this and that there isn’t more of a sense of nationalism on this issue rather than regionalism. We certainly have some of those issues, as well, as can be evidenced by the fact that New Orleans STILL hasn’t been rebuilt in many respects. 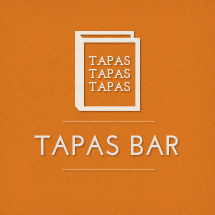 Hola Taste Memory :D I’m really happy you like it. I like ducks because they dominate the 3 elements: earth, water and air! Thanks Elly, I’m quite proud with the result :D too! Ahhhh Jen, this is so complicated… and you can never get everybody happy at the same time. Some decisions are good for some people and other for others. That’s why it’s great that it finally rains! Really? New Orleans is still not fixed? That was such a big drama… we couldn’t believe this kind of thing could happen in America!!! I don’t eat whole lot of duck (or meat) for that matter, but if I did,this might be the first of things I would choose to make. A really creative and interesting dish. Much more so than anything I’ve seen lately. Good luck in the joust! I love duck. This is a dish worthy of a 4 star restaurant. Yumm. very creative! you’ve made me realize i should not take the lime for granted!! this looks really divine – you should be proud of yourself! every time the joust comes up i always forget! sorry we haven’t talked about ‘the list’ yet, it’s been a bad week. But I promise to come up with something by next week. I’m still really excited about it! You better be coming up w/ yours! Wow Courtney… that’s BIG words :D Thank you darling! Nuria this is exquisite. In Greece as well it is difficult to find limes but have managed to find some for the first time and cannot find any raspberries either, although I looked into the frozen section as well. The jam idea is great. Hola Meeta :D Thanks for your words. I’ve seen you have a duck’s recipe too… isn’t this meat wonderful? That dish is winking at me! I think it’s a winner, Hermosa! This sounds like a lovely dish! I’ve only had duck once, but I really enjoyed it. Beautiful Nuria. You and Ruth – at Ruth’s Experimental Kitchen are both on the same wave length with the Joust’s ingredients. Could be an interesting challenge this month. Duck is a meat I enjoy a lot but it’s not present in my kitchen as much as it should be! Yes Giz! I’ve seen Ruth’s recipe… what a coincidence!!! Pork Loin in Salt and Herbs. And a Spanish Transport Strike!